Recently in Atlantic Canada and elsewhere we have seen dramatic changes in the fish stocks. The majority are in severe decline while others seem to be doing well, a few are even doing “very well.” A small minority of our fish stocks have been declared “healthy.” What are the reasons for the relative successes and failures of the various fishes? Many will explain the changes by pointing to patterns of fishing exploitation or “management” strategies (complete with many regrettable “mistakes”) that have been applied to specific stocks. Atlantic Canadian groundfish stocks are commonly cited as the worst example anywhere of “stock mismanagement.” The other culprits in the missing fish story are “changes in climate/temperature/’productivity’” and “destruction of habitat” (commonly meaning the damage done to the bottom by draggers). Both of these are contributing factors. However, OVERALL BIOMASS DEPLETION in the sea with resultant dilution/food scarcity/STARVATION actually offers a better explanation for today’s observed trends, and this can be seen by comparing the physical characteristics of the surviving fish stocks. Why is the Yellowtail flounder continuing to flourish on George’s Bank...an area that has been heavily fished by various methods including a major amount of bottom scraping? This little flatfish lives on the bottom, therefore it should be very vulnerable to the otter trawl. Also it should be suffering from the effects of habitat destruction as much as any other. It is a small fish, and smaller and younger fish are thought to especially suffer from the loss of bottom habitat that once provided lots of nooks and crannies wherein they could hide from predators. It seems a bit of a paradox that the most successful fish on the ruined banks are now the small bottom dwellers. (Similarly, it is also of note that on the badly scraped and flattened Grand Banks, small cod can live, but for some “unknown” reason the larger ones are dying...despite the ongoing fishing moratorium on that stock.) The yellowtail flounder seems to be tolerating the habitat destruction problem better than most fish, and this is also true for the “climate changes decrease marine productivity” problem. For some reason the changes in water temperatures, currents and upwelling patterns...are having markedly less impact on the yellowtail flounder as compared to the cod and haddock on George’s Bank, for instance. So, are we to believe that the successful rebuilding of the yellowtail flounder stock is the result of “good fisheries management?” This little fish was just lucky enough to be assigned to the brightest managers in the business? The relative continued success of the yellowtail flounder is largely due to the nature of the fish itself, and is part of an overall trend that can be seen in the marine ecosystem in general as it becomes increasingly impoverished and drained of life. Small flatfish, feeding at very low trophic levels, have a natural advantage in the current situation. Their small size and probably their flat design puts them at an advantage in basically picking up the last little crumbs that are scattered on the ocean floor. The same trend has been seen in other places. One example is the persistence of the greenland halibut or “turbot” after the Atlantic Canadian groundfish stocks were intially fished out. It is another small flatfish, looking like a cousin to the yellowtail flounder. Cod, haddock and pollock disappeared, leaving the little flatfish at a temporary advantage. The same pattern can be seen on the west coast of Canada and Alaska, where the “successfully managed” groundfisheries that are cited are the “rock sole” and the “Pacific halibut.” Both are flatfish, the rock sole being smaller (and looking like another cousin to the yellowtail), but halibut specimens are also noted to be smaller and smaller as time goes on. As the Pacific groundfish stocks disappear, the flatfish in that area are also enjoying some relative continued success. How is it that the smaller flatfish can persist? One key factor is their ability to feed at a low trophic level for a major portion of their lives. The longer that they can exist on worms and small crustaceans, the better. If they grow large enough that “fish” becomes very important in the diet, then life becomes much more difficult. This is the problem encountered by the groundfish species who feed on the bottom invertebrates when they are very young but as adults they really need to eat other fish. Perhaps it is hard to derive enough nutrients from worms and jellies (high water content, not enough protein?) and small crustaceans (too much work to catch them and too much shell?) to provide for the needs of the larger fish. Maybe they need something “meatier.” For whatever reason, fish (flat or round) that normally depend on other “fish” as an important part of their diet...are not doing as well these days. This includes the larger individuals in the flatfish as well as the “round” groundfish, although the “fish-dependency” of the “round” ones seems to be greater. A marine system that is being steadily drained of life will be dismantled from the top down. That is why the “apex” predators are in such trouble today, the larger predators like big sharks, swordfish and bluefin tuna are in serious decline which will unfortunately continue, whether or not new conservation measures are implemented to “protect” them. Those fish need “fish” to eat, and the tiniest ones will not do...and they simply cannot sustain themselves on the likes of marine worms and jellyfish. If we fail to enrich the system with food (...nevermind “if” - it’s actually already a done deal...) fish like the swordfish and bluefin tuna will inevitably become extinct in the near future. Even the impossible option of stopping the harvest of these fish at this time will not result in their recovery since their food species are so scarce (and we would undoubtably continue to drain the system from some other point anyhow) - proof of this can be seen in the story of the failure of the Grand Banks northern cod stock to rebuild since the moratorium. SINCE ALL MARINE CREATURES ARE NOW “FISHING DOWN THE WEB” THE SMALLER ONES (BOTH THE SMALLER SPECIES AND SMALLER INDIVIDUALS WITHIN SPECIES) ARE IN THE BEST POSITION TO SURVIVE, BECAUSE THEY NORMALLY FEED AT THE LOWER POSITIONS. The pattern of smaller species persisting, and then smaller individuals within those species, is very consistent with the problem of compulsory feeding lower in the web. We are frequently told that fish are “smaller” on average today because of an effect of size-selective fishing methods - the selective culling of the genetically faster growing component. This is very doubtful. A close look reveals that “size-selective culling” seems not only to have happened WITHIN species (as predicted by the theory), but has also happened BETWEEN species (not at all predicted by the theory). Examples of “size-selective culling” between species can be seen in the tuna family (all have been traditionally exploited by various fishing methods...but the larger ones - bluefin and bigeye - are in far worse shape than the smaller ones - yellowfin is midsize as is it’s success today - skipjack and albacore are the smallest tuna and by far the most abundant and frequently caught today. Why are the littler tunas having the best “luck” at present? It’s because it is easier for “smaller” animals to successfully feed themselves when food starts to become scarce.) Of the seven species of Pacific salmon (which as a group are in big trouble), the pink salmon is the most abundant. All have been fished. And all have been “managed” by today’s state-of-the-art fishery management methods. Why do the significantly smaller pinks persist? “Better management” or just a fish that is better adapted to subsist on little stuff, not heavily dependent on having “fish” in it’s diet? The recent big “skate story,” however, has been the virtual extinction of the barndoor skate. Like the others, it has been frequently caught as an unwanted bycatch in fisheries. But for some reason the barndoor skate has found itself much more vulnerable to depletion by this method than it’s cousins. The range of the barndoor was as wide as the others, and it was not “rare.” In 1966 it was described as “very common at Tignish, PEI, frequently at Canso, N.S., and along the Nova Scotia coast, all parts of the Bay of Fundy and St. Mary’s Bay...offshore at Banquereau and Sable Island Bank...to the southern edge of the Grand Bank...” What sets the barndoor skate apart from the other skates? It is mainly SIZE - the barndoor is a remarkably larger skate than the others. Does any evidence exist to support the idea that the barndoor skate is disappearing because of starvation? As much as I would like to, I do not expect to find statistics on “condition factor” for the barndoor skate. Perhaps, however, some clue can be deduced from a comparison of pictures of this animal. Not a “scientific study,” to be sure, but illustrations of the barndoor skate that were done decades ago show a noticeably plumper mid-section than one I found that was done in the 1990s. The later sketch gives the impression that the fins are getting bigger...but of course it is the same illusion that can be seen in other fish species (e.g. the basking shark)... the fins are the same size as ever, it’s really the body of the fish that is getting smaller. My conclusion is that “fishing down the web” has proved to be too big of a challenge for the barndoor skate. “Size-selective culling?” Yes, it has occurred within the family of skates...and it cannot be due to “fishing methods” in this case, size-selective culling is the result of size-dependent feeding patterns. The big ones starve first. THE CRASH OF THE GROUNDFISH STOCKS IN ATLANTIC CANADA WAS AN ECONOMIC DISASTER...THE ONLY SAVING GRACE FOR THE FISHING INDUSTRY WAS THE SUBSEQUENT RISE IN VALUABLE CRUSTACEANS - LOBSTER, SHRIMP AND SNOW CRAB...IS THIS REALLY A HAPPY STORY? Many displaced groundfishermen in Atlantic Canada were eventually able to resume fishing by redirecting their efforts towards the booming populations of crustaceans. (Why the “boom?”...it was largely the result of the disappearance of their natural predators...”stock management” by humans was largely irrelevant.) The province of Newfoundland eventually boasted of record profits from its fisheries based on the newly successful shrimp and crab fisheries as well as aquaculture...more money made than in the heyday of the great cod fishery! However, as unpopular as this opinion may be, the truth is that these fisheries are doomed as surely as the cod fishery was. The enthusiastic harvest of the shrimp and crab stocks only continues to rapidly drain the system, and even these “lowly” marine animals will necessarily go into decline as a result. Nothing can live on “nothing” and that is where the system is headed if we refuse to replace what we take out. So “when” can my gloomy prediction of disappearing crustaceans be expected to come true? In Atlantic Canada the answer is “any time now.” A few weeks ago it was announced that an unexpected dramatic decline has occurred in the Newfoundland snow crab stock, and therefore the quota must be slashed. This is devastating news for the people who were so recently affected by the collapse of the groundfisheries. But there were warning signs in the snow crab. In recent years they were noted to be increasingly affected by a parasitic disease called “bitter crab disease.” Malnutrition weakens the immune system of any animal so the prevalence of problems like “bitter crab” are warning signs of trouble. Lobster stocks have also been declining in the last few years in Newfoundland. And the Newfoundland shrimp - how are they doing? Catches have been high and quotas continually increased, although DFO states that “TAC’s in this area are purely ‘experimental’ with no biological basis”...but research data suggest that the latest year-classes of shrimp are weaker than those that came before...I see another red flag. Does anyone else see it? Why the focus on Newfoundland? This area deserves a close look because it is probably the part of the world ocean that has been fished the most heavily over the longest time, and the end result is that the starvation problem is worse there than elsewhere. The patterns of change in marine life in Newfoundland can be expected to be repeated elsewhere as fishing is continued. Is there any evidence of this? The Scotian Shelf off eastern Nova Scotia has severely depleted, definitely “not-recovering” groundfish stocks. But the abundance of snow crab in the area is increasing...is this really good news? And the “healthy” Nova Scotian snow crab stock has been noted to have an unusually high incidence of soft-shelled crabs... Further south in Nova Scotia there has been a dramatic increase in the abundance of lobster (correlating to the loss of the groundfish in the area). In the fall of 1999 there was another sharp increase in the abundance of lobster in Southwest Nova. This looks “good” to a lobster fisherman, but is in fact highly abnormal, and points to a system that is rapidly changing and severely out of kilter. Lobster are also showing signs of stress in this area: shell diseases are more common, and there is an unexpected incidence of “soft-shelled” lobsters. These are warnings. The story of the Newfoundland snow crab is another warning...the disappearance of those crabs definitely does not signal a recovery of the groundfish! It is not a balancing act, it can be better described as a ecosystem on a slippery slope. What is the point? I am trying to make two main points. The first one is an attempt to take an “ecosystem approach” to interpreting changes and deciding what course of action is best to take. A sharp rise in crustaceans in a fished-out area is not a sign of “health” - the health of the system as a whole is what must be considered, and studying and analyzing fish one species at a time is worse than futile. And raising the TAC on the last surviving sea creature just hastens the demise of the whole system. None of them can hope to live in isolation, nor can they live without food...which is my MAIN POINT. Look again at the fish! Signs are everywhere that they cannot find enough to eat. Mathematical calculations of nitrogen inputs do not feed fish! Nitrates in sewage, silt and soot do not feed fish! ...a big problem is that those items are all that we have offered them for too long. My suggestion is simple (although it would be an awesome undertaking)...we urgently need to start “feeding the fish” by delivering some form of solid edible organics to the former fishing banks: food scraps, fish plant waste, slaughterhouse waste...whatever non-toxic edibles we can spare. Our fish stocks are sinking fast...what else can we throw them as a life line? 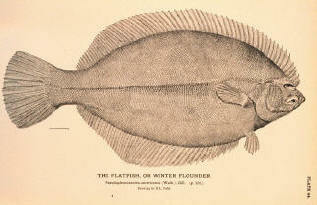 Flounder Illustration at top of page from NOAA historical collection.